﻿ Le Méridien Kota Kinabalu (Malaysia) | FROM $89 - SAVE ON AGODA! "The hotel are located nearby to all the tourist spots , real..."
Have a question for Le Méridien Kota Kinabalu? "While the hotel is generally slightly dated, the rooms and bathrooms were very clean and the facilities were sufficient." "Very nice hotel, kind staffs and good menus"
"Staff is very friendly and helpful, providing good service!" "Nice rooms, friendly staffs, awesome breakfast menu, nice po..."
This ultra elegant hotel, featuring newly refurbished rooms, situated in the downtown area, is within walking distance to the commercial district. Guests will enjoy an easy walk to a vast selection of historic, cultural, and commercial areas as well as the business and financial centers. The hotel also provides immediate access to some the most pristine beaches in Malaysia in addition to professional golf courses. The hotel also boasts magnificent city views, alluring vistas of Mount Kinabalu, and panoramas of the South China Sea. Four unique restaurants serve a vast compilation of fine cuisines in a refined atmosphere perfect for intimate meetings or business dinners. Le Meridien Kota Kinabalu Hotel is a luxurious venue that offers opulent surroundings, amazing views, and unfettered city access. "I would definitely recommend it!" The cardholder of the card made upon booking must be present upon check-in. The property has the right to request for another card or reject stay/check-in if failure to do so. The property is undergoing renovation from January 1, 2019 to May 31, 2019. There will be some areas affected by the noise from 09:00 AM to 06:00 PM. For further queries, please contact the property directly. The room is clean, except there's a stain on the window which spoils the sea view. I guess this is due to the rain water. Bed, bathtub and shower all good too. Staff is friendly and helpful. For those who are looking for an easy access in town, especially to go to the "Philippines Market" and the nearby souvenir shop, this is the best hotel. It's within walking distance to all these tourist attractions, but if you are enjoying a sea view, want to relax yourself or want an access to the beach, you might prefer to look for other 4-5 star hotels. We love that there’s HBO & fox movies in the tv channel. Staffs are friendly & helpful too. Bed is comfy too. However, we expected more from Le Meridien as a 5 stars hotel. Room is spacious, however look empty- no teaspoons, only 1 robe for 2 persons? Windows are very dirty, maybe is due to constructions. The room is badly soundproof, we can people talking along the corridor middle of the night. They should have plastic trash bag in the dustbin as well. Standing shower space is bit small & squeezy. For the rate we’re paying, breakfast should be included. Overall, it’s very pricey based on what we got. We’ve stayed in a 4 stars hotel in KK with much better facilities. Don’t think will come back again. It was wonderful staying with this hotel. The only thing was that my suitcase's bottom part/wheel were broken while I was out for 2 days in Mt.Kinabalu and it was not clear who did it(luggage handling mistake or myself) but anyway they taped the part and I traveled ok. Thank you! While the hotel is generally slightly dated, the rooms and bathrooms were very clean and the facilities were sufficient. 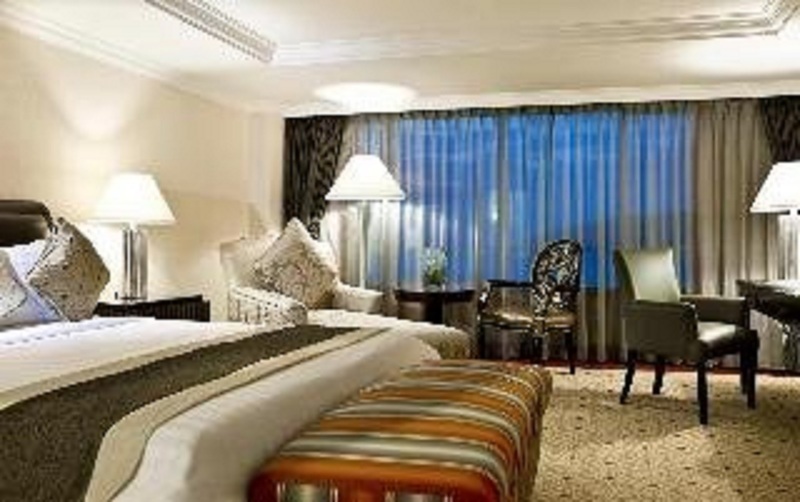 The rooms were also large and spacious and the hotel itself is in an excellent location. The staff were very friendly, efficient and accommodating. At the buffet breakfast, when they realised my family was vegetarian, they asked if we required them to specially prepare something additional to what was was already available. If I were to go back Kota Kinabalu, Le Meridien would my choice again. I had a great time staying here. Will definitely come back. It is so near to the market and Jamilah pearl shop. My daughters could just walk around exploring the area themselves. The best thing was that we managed to book last minute tour from within the hotel itself. Comfortable bed and nice rooms. Hotel is located in the centre of town which nearby to all hot spot attractions. Totally perfect choice for those travels as business or leisure. Will return to this hotel. Well located, fairly helpful staff. Comfortable rooms Issue was with the food - breakfast and in room dining - very very average. Breakfast options were plenty but food was mostly cold .. the in room dining food I ordered 2-3 times was tasteless and portions were small. Also the cleaning of the room was perfunctory! Due to the renovation only 2 lifts operate which creates a crowd in the lift lobby! Otherwise the stay was comfortable! I got upgraded to a larger room with a seaview and it was fantastic. Very spacious and clean. The hotel is designed with the guests' comfort in mind. However, the windows need serious cleaning as there are water marks covering the whole window facade, probably due to the renovation and extension at the rooftop. The last time I went there was back in 2007-2008. So many upgrades have been done. Nice rooms, friendly staffs, awesome breakfast menu, nice pool area, very good location to walk around outside hotel etc. The hotel stay was a very nice one except for the renovation works noise from 9am to 6pm which they failed to inform me earlier. It is so hard for me to put my toddler to sleep for her afternoon nap. We stayed in a seaview room, view was fantastic especially the sunset view. Bed is wonderful, there is a bathtub and shower. Hotel is clean, staff courteous. Wifi is strong. This hotel is nearby to many shops, it is close to Kedai Kopi Seng Hing which is important to us as we are fans of their tuaran mee. Not what you'd expect from a Le Meridien Hotel comparing to Shanghai or HK properties. The rooms are super spacious, but feel empty and lack basic comforts, one chair and one robe for 2 people, no tea pots or even a teaspoon in the room, only plastic stirrers (how about keeping those ocean's clean, huh?) . In-room dining on the phone was uncertain about delivering a teapot to the room within 20mins. Booked a room facing the harbour, can't imagine any other option. Seen falling debris size of an egg from the roof construction above into the pool and the terrace deck, pool closed off partially for that reason, still Korean guests taking selfies with the panorama ^ ^ beyond regardless of the obvious hazard. Check-in went smooth and pleasant staff but rather basic courtesy. COOLEST PART: the first hotel in Asia, where the DND sign on the door is still respected. Nobody called, checked the room, left any notes under the door, for 3 days, etc. which we highly appreciated. Well done! The hotel are located nearby to all the tourist spots , really convenient to walk everywhere. I thoroughly enjoyed my stay at Le Meridien Kota Kinabalu, and hope to be able to stay there again on another occasion. The Meridien is conveniently located along the waterfront, is close to many eateries of all sorts and also next door to the Centrepoint Mall. -- In terms of facilities, the hotel offers everything one would need; comfortable rooms, a scrumptious buffet breakfast, a clean refreshing pool and thoroughly professional staff. -- For dinner, try the Korean restaurant across the road (you can see it on your left as you exit the hotel) OR go to Kohinoor Indian Restaurant on the Waterfront. 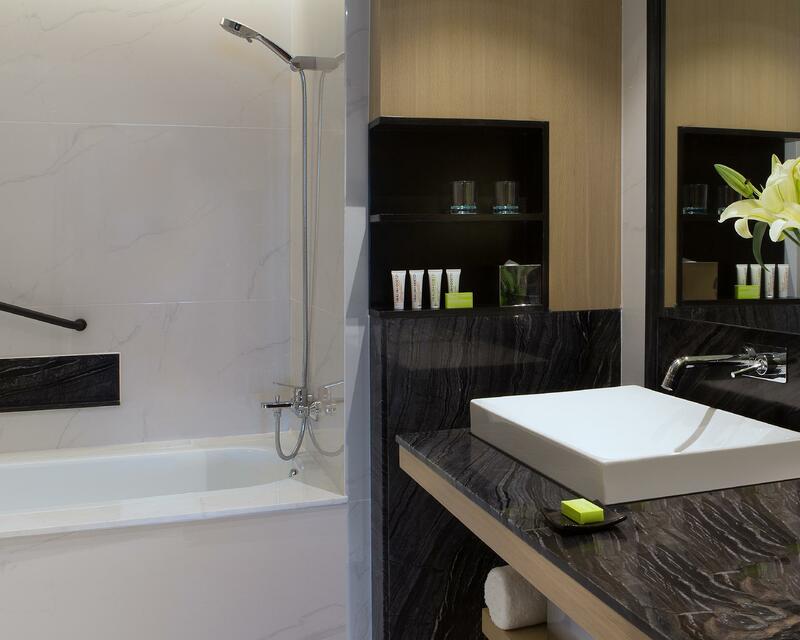 Le Meridien in Kota Kinabalu is an efficiently-run hotel, perfect for a relaxing stay. Although the price I paid per night was rather steep, at least the hotel delivered all they promised. The room was spacious, fully-appointed and sported the most wonderfully comfortable bed. The included buffet breakfast offered a wide variety of tasty food. In addition, the pool was clean and wonderfully refreshing. -- I would definitely consider staying there again. Very satisfied. The location is strategically in front of Market Sinsuran / Philippine Market. The hotel's cleanliness and amenities are very satisfying. Varied breakfast buffets and very tasty. Staff are also friendly and professional. The room rate is quite expensive because of its strategic location. However, if there is any promotion/discount on the room rates, I will definitely choose this hotel again. Thank you. Excellent location and very nice sea view. Comfortable room, very clean, great service. Nothing to complain about. Can't comment on the breakfast, though. We opted for no breakfast as we had early outdoor activities daily during our stay. We don't visit KK often, but this hotel is our fav whenever we stay in KK. Worth every cent. I had three days at Le Meridien - a great location on the waterfront and superb sunset views over the sea. Excellent 25 m swimming pool, well-equipped gym, comfortable Club Lounge, but some strange design features of my room (619) - with a curved desk squeezed into a corner and a sofa plopped in front of the window (to open curtains I had to crawl over the sofa) and a huge unused area between the wardrobe (inadequate shelves for clothes) and the bed. I wonder if hotel designers ever actually sleep in the rooms they design ...?